This 16page booklet is filled with more than 30 step-by-step instructions to make picture frames, lampshades, memory books and photo albums, party invitations, and much more. Also included are application step-by-steps for sponging, accenting, and mixing. Add to Paper Perfect Paints to create a unique and special effect. Click here to view an example of mixing this Paper Perfect Accent with Paper Perfect. 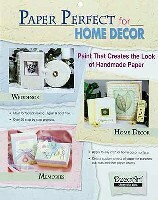 Designed for use with Paper Perfect Paint and other DecoArt products. Ideal for painting or blending. Easy usage, create quick effects Soap and water clean up. Create directional texture or dry brushing by using the fan brush in a light sweeping motion, going from side to side or up and down. Create coarse texture effects by applying heavier pressure to sweeping motion. Holding the fan brush upright and using a tapping motion creates a fluffy effect.